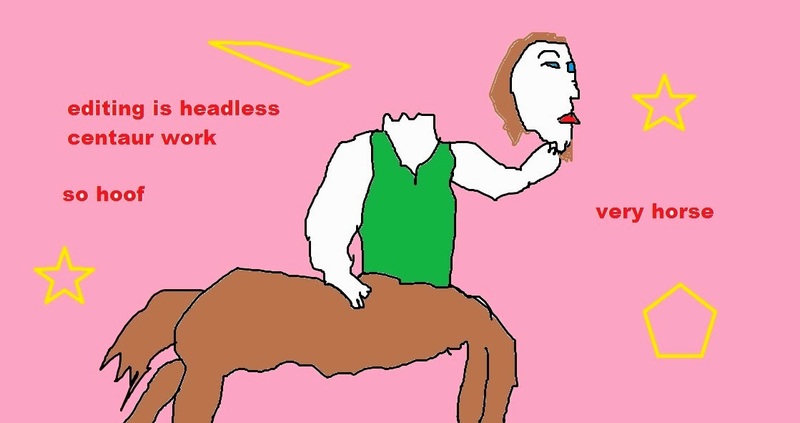 Editing is headless centaur work. Did you know that? This is more of a pep talk to myself about editing. Ah, editing. For some, they rather dip their head and gasoline and run screaming through a field of glass scarecrows. What? I don’t know. People don’t like it. It’s for this reason I believe the vast majority of my manuscripts have gone unfinished. It’s because I like writing first drafts, planning, and getting ideas. It’s just when it comes times to mold it into something intelligible is when I’ve crapped out. Well, not this time. I’ve managed to keep steady work about 30 minutes or so a day editing my current novel. If things go how I expect, I should be finished with my first round of edits this August. At least this is my hope. The main issue with editing is that it takes a long freaking time. Unless you have a fail proof system (I don’t) it is a pain-staking process at times. You have to make sure things make sense, plotlines are completed, characters evolve, etc. There are several things you have to juggle to forge a solid story. My main concern for myself and other writers is that patience sometimes kills a promising project. Instead of working on it to make it better, you may get frustrated and start something. Take it from someone who has done that time and time again: don’t fall into that trap. That way horseshit dwells. So even though editing takes forever, stick with it. Get it the best you can get it and then start the new exciting venture of figuring out who wants to buy it. Maybe that’s a story for another day. Next Post: Are You Meant to be a Novelist?